There comes a time in life when a big change occurs – and this is that time of life for Dice Hate Me Games. We are now proud to announce that we will be officially merging with Greater Than Games! As many of you already know, Greater Than Games are the publishers of awesome games such as Sentinels of the Multiverse, Sentinel Tactics and Galactic Strike Force. We will now all be operating under the same corporate banner, but with three imprints: Dice Hate Me Games, Sentinel Comics, and a brand new entity, Fabled Nexus, dedicated to fantasy and sci-fi themes. 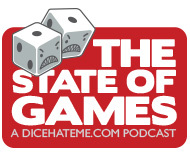 Dice Hate Me Games will continue to bring you games with the same quality play, feel and aesthetics as before, but with the expanded resources that Greater Than Games has to offer! Plus, we’ll be able to create, scout and develop a whole host of other games that might fit under the Sentinel Comics and Fabled Nexus brands. In other words, we’ll be bringing you even more amazing games in the years to come! We are excited about the possibilities of this merger, and we guarantee that you’ll all be amazed at what we have planned. So stick around and enjoy the fulfillment of the Dice Hate Me Games motto: The Future Looks Fun! Can you identify everyone in the pic so we know who is who? Sean – Absolutely! I should have done that the first time. 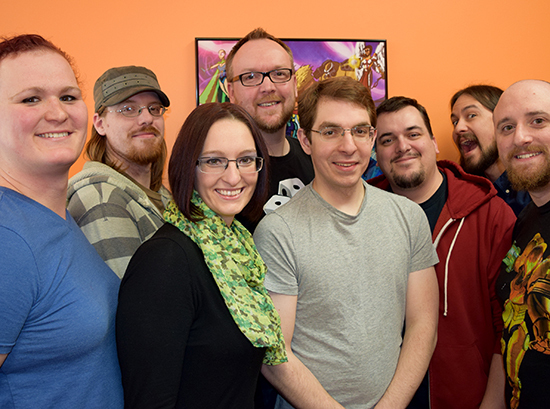 From left to right are: Jodie Wagner (Warehouse Manager), Craig McRoberts (Community Overlord), Jennifer Closson (Graphic Designer), Chris Kirkman (Me! Game Development Director), Paul Bender (Operations DIrector), Darrell Louder (Logistics Consultant), Christopher Badell (Game Design Director), and Adam Rebottaro (Art Director).